•Full sole Leather Ballet shoe is made of premium grade leather. our Intermedia Ballet shoe is with traditional straight outsole, and suede insole, insole shape just model your foot left and right for comfort. • Full cotton lining and absorbent suede insole reduce moisture. 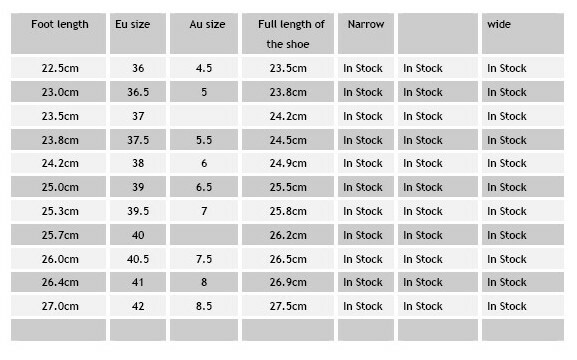 Fitting: size chart is well fit size, for lady which is stop growing and prefer a great fit, if is a growing foot, specialy age around 10-14 yrs old, is recommended to have the full length 10 mm longer than the actual foot length for comfort. 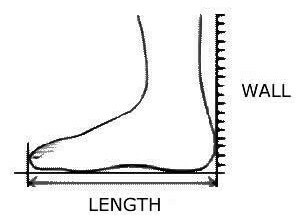 This is guideline to help you to determine your foot length. Stand up with the heel attach to the wall and measure the distance between the wall and the very last end of the longest toe, to have you foot length, for more information please email us. I have added on au size for your reference, Due to different brand size could be slightly different made, will highly recommend to follow our measure instruction and size chart as a guide.